This is a list of choirs associated with the Parish of Our Lady and St. John. We would like to invite anybody who is interested in finding out more information to follow the directions given by each of the groups, or to contact the Parish Centre – phone 021 4371109 or email: carrigparishcentre@eircom.net You will always be most welcome! has been singing at the 11.15a.m. Sunday Mass in the Church of Our Lady and St. John since the early eighties. Our aim is to lead the singing at the Mass thereby enhancing the celebration. There have been many singers and musicians involved over the years, and the choir in 2014 is the strongest it has ever been, boasting over 20 members. Some of these have been in the choir for nearly 30 years and must surely be entitled to medals at this stage! The current musical director is Jim Kelly who joined the choir in 1996 and took charge in 1997. Jim plays guitar and conducts the group. He is ably assisted by Cathy O’Rourke who also plays guitar and mandolin. Other instruments in the group include violin, concert flute, concertina and tin whistle. This enables the group to play instrumental pieces at reflective parts of the Mass, such as the Offertory and during Holy Communion. The group has a very eclectic repertoire built up over the years. This ranges from traditional, well-loved hymns, such as Amazing Grace, through to more contemporary material from composers such as Liam Lawton, Carey Landry and Feargal King. The choir leads the singing at the 11.15a.m. Sunday Mass from early September until the end of May each year and practises in the Parish Centre from 8.30p.m. on Thursday evenings. They also participate in the Children’s Mass which takes place at 11.15a.m. on the 3rd Sunday of each month. Many people make the effort to attend the 11.15a.m.Mass on a Sunday as they enjoy singing the various hymns with the choir thereby raising their participation in the Mass. A particular favourite is ‘Our Father’, composed by Estelle White, which has the congregation and choir united in tuneful prayer. 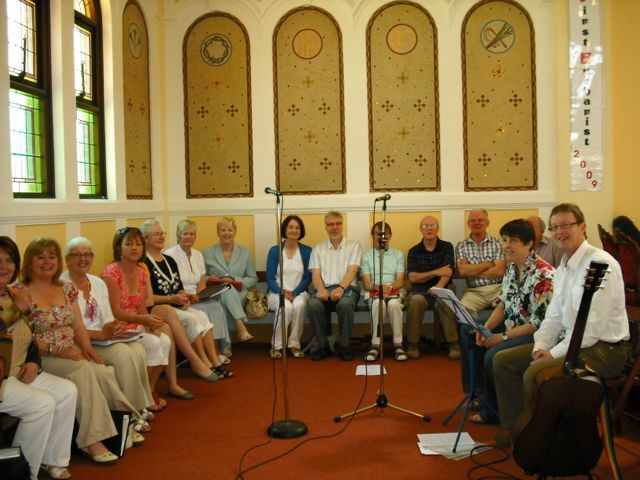 The choir has an active social life and regularly performs at weddings and other occasions. New members are always very welcome, whether singers, musicians or both. Please contact Jim Kelly on 086 2321064 for more details. 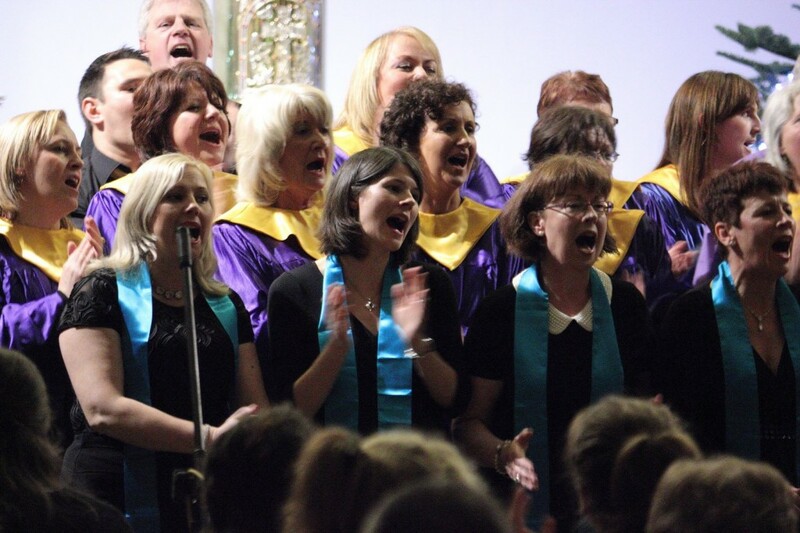 2013 was a particularly busy year for the members of the Carrigaline Gospel Choir singing inside and outside of the parish. Easter Sunday and Christmas Eve masses were especially uplifting, as were the variety of mass times that we got to sing at during the September to May season. Over the Christmas period we returned to Blarney’s Castle Inn Hotel to join the Dave Murphy trio and performed at Electric Bar in aid of the Carrigaline Family Resource Centre. The highlight was bringing together 100 Gospel Voices, from three Gospel Choirs, in front of a packed church raising €2,400 for COPE Foundation. The choir, which was founded in 2005 by Sr Nóirín, has grown to 35 members and a 4-piece band, making it a vibrant, energetic and uplifting choir.We welcome new members and are looking for a few more Tenors and Basses at the moment. Contact Karen Cogan on 087-659 8721 to arrange a brief audition. Their lively music enriches the liturgy, and both the congregation and choir members leave feeling uplifted and energised. Over the years they have sung in other parishes and performed at other occasional events. Well it’s not just all about singing! The members see it as something that they really love, making them a vibrant and enthusiastic choir who has a great time doing what they do. While it is fun, challenging and amazingly fulfilling, the weekly practices can be tough at times to get the four-part harmonies to come together! Karen Cogan, an experienced choral singer, who has performed nationally and internationally, is the choirs’ current director. Auditions for new members are mainly taken in September and January. The choir sing at two Masses a month. In existence a very long time, we welcome new members at any time. The commitment is light as we practise and sing at the 12.30p.m. Mass just once a month. The other Sundays are looked after by cantor and organ. The commitment is greater at the principal church feasts—Easter and Christmas, when we assist at the special ceremonies. Further info can be got from the director/organist Frank Garvey (087-7576254) or from any choir member. Like most Irish rural parishes there was probably always a church choir of some kind in Carrigaline dating from the time when the old church on Church Hill was functioning. Frank Garvey, the present director took over at the request of the late Canon Shinkwin in 1963 and has always endeavored to present good quality traditional church music whether in four-part harmony or plainchant. Following a succession of very poor instruments our church became home to a really lovely old English organ in 2001 on the initiative of the then parish priest Canon O’Brien. It was built in 1891 by Alexander Young in Manchester, suffered bomb damage during the 2nd World War, was restored by Jardine & Co. in 1948 and when it finally became redundant was located by the Cork based organ builder Dermot Locke and transported to Carrigaline. It was cleaned and fully restored on installation in our church. It is a two-manual and pedal instrument, with full mechanical (tracker) action and is in original condition. It is I believe the only organ by Alex. Young in Ireland and in the opinion of a number of experts is an excellent quality instrument.